*Listed In Mens Sizes, for Womens Sizes. Please Order Up 1.5 sizes, Size 9 Mens = 10.5Womens The Vans Drained and Confused Authentic from Vans Original, is now an iconic style made in unisex! These feature: All over pineapple canvas print, classic low top lace-up skate shoe that has durable double-stitched, all over printed canvas upper, metal eyelets, padded tongue, and a signature vulcanized rubber waffle outsole! 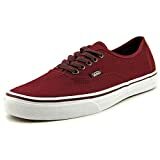 Vans is an American manufacturer of shoes, that also produces apparel, and other products such as T-shirts, hoodies, socks, hats, and backpacks. The brand is active in the actions sports industry and sponsors skateboard, surf, snow, BMX, and motocross teams.